Background: In Sub-Saharan Africa, HIV endemic has substantially contributed to the increasing tuberculosis (TB) incidence. The joint effect of the HIV and TB pestilences has confronted the feeble systems of healthcare in resource-limited countries. Methods: The aim of this study was to determine the pathological attributes, outcomes of TB treatment, and the contributing factors of unsuccessful results among TB/HIV patients. A retrospective cohort study of all confirmed adult TB/HIV coinfected hospitalized patients with drug-resistant TB reported for the treatment in two different hospitals from 2010 to 2016 in Eastern Cape, South Africa. Cox proportional hazard model was used in identifying the predictors of unsuccessful treatment. 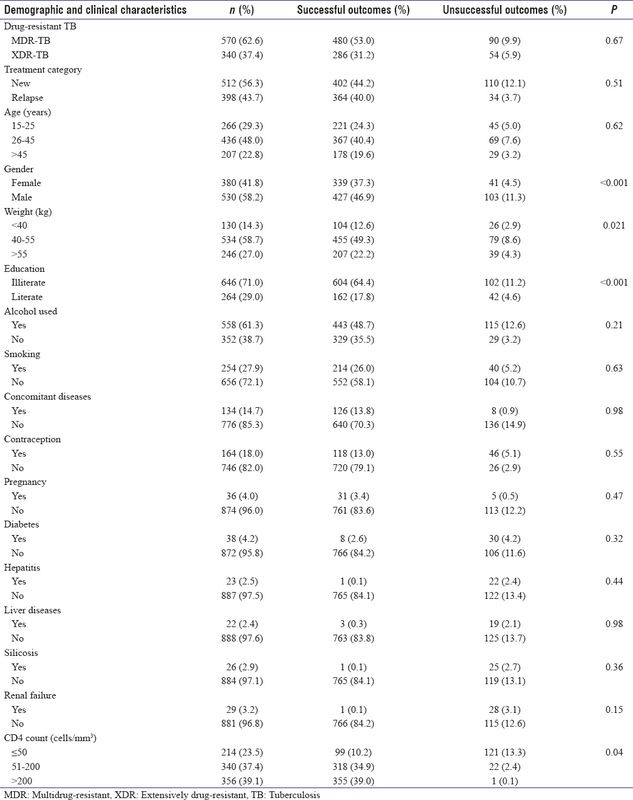 Results: Unsuccessful treatment outcomes among TB/HIV coinfected patients with treatment category were (95% confidence interval [CI]: 0.988–1.318) age, smoking (1.047; 95% CI: 0.892–1.229), pregnancy (1.940; 95% CI: 0.793–4.743), CD 4+ count (1.163; 95% CI: 0.993–1.361), and patients with comorbidity diseases such as diabetes, liver diseases, renal failure, hepatitis, and silicosis were all significantly associated with unsuccessful treatment. The preantiretroviral treatment (ART) females appear to have significantly better survival than pre-ART males. Conclusion: The study showed that the unsuccessful treatment outcomes among TB/HIV coinfected patients were slightly below the WHO target. 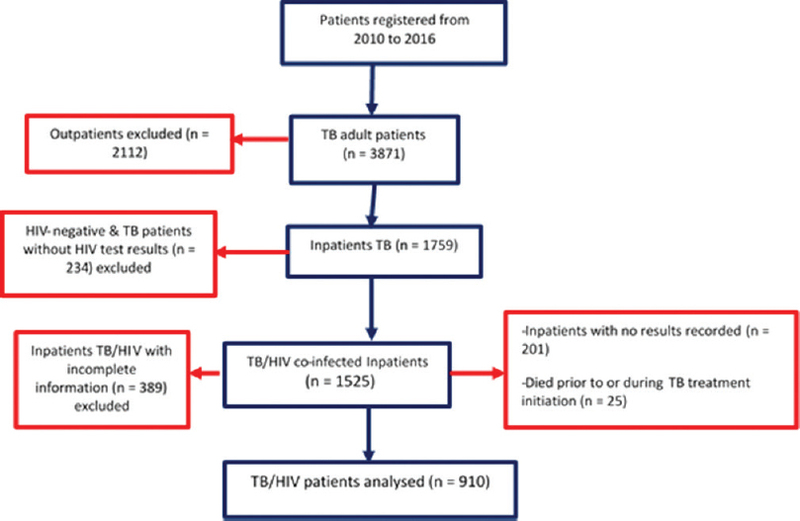 The key predictors of unsuccessful TB treatment outcomes among the TB/HIV coinfected patients were associated with pregnancy, productive age group, gender, contraception, and comorbidity diseases. Tuberculosis (TB) is a global health issue and has been affecting lives and well-being of a large number of people for so many years. Globally, TB was estimated to be among ten causes of death in the year 2015 and ranked above HIV/AIDS as one of the main sources of death from a communicable disease. In Sub-Saharan Africa, HIV endemic has substantially contributed to a rise in TB incidence. South Africa was ranked fifth among the highest TB incidence globally, and first among TB/HIV coinfection cases with more than 65% of TB/HIV coinfected patients., The progression rate of HIV comorbidity changes clinical factor of TB to a high mortality rate. However, HIV disease is possibly significantly affect TB treatment results and a major purpose behind the inability to achieve the control targets among TB/HIV settings. For systematic control of TB in HIV prevalence settings, the World Health Association (WHO) has suggested that TB/HIV cooperative exercises, whose targets are to make components for joint effort among TB/HIV and AIDS programs, are to decrease the weight of TB among HIV individuals and the weight of HIV infection among TB patients. In a bid to reduce the burden of TB, a large number of cases of drug-resistant TB were discovered and continue to rise. Globally, 3.3% of new cases of multidrug-resistant (MDR) TB were recorded, 20% of them were previously treated, and 23% of these cases were initiated on appropriate treatment. In 2014, the death from MDR-TB was approximately 30% and led the WHO to declare it as a global crisis. A systematic review of a study conducted demonstrated the advantages of ART in reducing TB mortality and was revealed 44%–71% reduction in TB risk of death. TB mortality among TB/HIV patients is an indicator measure used to know the impact of TB/HIV collaborative activities. With the advent of ART, TB, and HIV have turned out to be progressive evident that they are not a homogeneous category, and loss of lives during TB treatment vary among TB/HIV patients on ART and without ART. Understanding the TB treatment outcomes and associated factors may help in better TB disease management. Therefore, this study aims to determine the pathological attributes, outcomes of TB treatment, and the contributing factors of unsuccessful results among TB/HIV patients among TB/HIV coinfected patients in some selected TB centers in Eastern Cape, South Africa. This was a hospital-based retrospective cohort study of all confirmed adult TB/HIV coinfected patients with drug-resistant TB reported for the treatment in two different hospitals (Winterberg TB hospital and Fort Grey TB hospital) in Eastern Cape, South Africa, from 2010 to 2016. These TB hospitals are specialized provincial government-funded TB hospitals. They offer specialized care for patients with various pathologies of TB diagnosis, treatments, prevention, and patients with HIV coinfections. They serve as the referral unit for the management of adults diagnosed with TB infection in environs. They serve the following districts: Nkonkobe, Amatole, Chris Hani, O.R Tambo, and Western district in Eastern Cape. They provide services such as antiretroviral treatments (ARTs), TB services, X-ray, and other services. All TB cases diagnosed are found on the standard TB treatment used in South Africa and reported according to the national TB control guidelines. Medical history of all patients from the 1st date of initiation consultation to end date (discharge) is recorded in TB treatment registry, which is the official TB record in reporting TB treatment of Department of Health, Republic of South Africa. Transferred out: Patient who was referred to a facility in another district to continue treatment and for whom the treatment outcome is not known. TB treatment record register was used to identify TB cases as designed by the Department of Health, South Africa. We included all new adult TB/HIV coinfected patients (aged ≥15 years) registered and started TB treatment in the study, i.e., all adults TB patients (n = 3871). Of these 2112 outpatients, 234 HIV-negative and TB patients without HIV test results, 389 inpatients with incomplete information, inpatients without any results recoded, and patients died before or during TB treatment were excluded from the study. TB treatment of all TB/HIV coinfected patients with or without ART was also encompassed in the study. Thereafter, 910 TB/HIV coinfected patients remained eligible for the study analysis. The criteria are shown in [Figure 1]. In univariate analysis, the survival analysis is carried out with respect to the factor under the study, which mostly disregards the influence of other factors. Univariate analysis most use to construct survival curves (Kaplan–Meier curve) for different groups of patients and use the log-rank test to examine the difference between the groups. However, the log-rank test gives a P value for the group differences but offers no estimate for the actual effect of the covariates. In light of this, using a model will improve the methods, which can be evaluated with respect to many factors simultaneously and also expresses the effect strength of the estimates for each predictor factors. The descriptive and inferential statistics were conducted to analyze the data regarding descriptive statistics for continuous data and categorical data. For the comparison of time to unsuccessful treatment among the groups of patients and Kaplan–Meier curve was also used for the comparison. Bivariate and multiple Cox regression models with variable selection using stepwise procedure were used in identifying the predictors of unsuccessful treatment. The assumptions for the proportional hazard model were assessed graphically using log-minus-log survival curve. Variables with P < 0.25 were included in the bivariate Cox regression analysis and considered as candidate variables for multiple Cox regression analysis. P ≤ 0.05 is a statistically significant-associated factor in the final model. From March 2010 to February 2016, 910 TB/HIV coinfected patients were selected from two different TB centers used in this study. There were 530 (58.2%) male and 380 (41.8%) female patients with a median age of 37 years and interquartile range of 27–47 years. These patients were mostly illiterates (71.0%) had body mass index (BMI) of 18.5–24.9 kg/m2 (58.7%), new treatment category (56.3%), MDR-TB (62.6%), and among them (39.1%) had CD4 count of >200 cells/mm3 [Table 1]. It appears that among those with MDR-TB (15.8%) has unsuccessful outcomes, while among those with XRD-TB (15.9%) had unsuccessful outcomes. There was the statistically significant association with gender (P < 0.001), baseline BMI (P = 0.021), education (P < 0.001), and CD4 count of patients (P = 0.04). However, drug resistance, treatment category, age group, drug use, pregnancy, and concomitant diseases were not statistically significant with treatment outcomes. Successful treatment outcomes were attained by 543 (59.7%) of the patients (with 26.7% cured and 33.0% classified as treatment completed), and 367 (40.3%) had unsuccessful treatment outcomes due to “defaulted” (12.4%; n = 113), “died” (5.1%, n = 46), “failed” (17.0%, n = 155), and 53 (5.8%) were transferred out to other facilities. For the variables characteristics in the dataset, time until treatment outcomes of the coinfected patients was analyzed using the Kaplan–Meier estimator to compare the survival time among the patients. The estimator was used to evaluate the survival distribution function of the time from the new patient was admitted for TB treatment until patients' complete treatment or cured or the patient died. The survival curve shows a decreasing trend of mortality rates among the coinfected patients over the study time. The figures produce product-limit estimates of the treatment of TB/HIV coinfected patients by male and female insertion [Figure 2] and [Figure 3]. In [Figure 2], the comparison indicates that there is different in the treatment success of TB/HIV coinfected patients without ART. The pre-ART females appear to have significantly better survival than pre-ART males while in [Figure 3], there was a different among both genders. The gender differences are significantly different between males and females receiving ART in this study. The univariate and backward stepwise likelihood ratio in multivariate analysis of the association between the possible determining factors of unsuccessful treatment outcomes among the TB/HIV coinfected patients were performed. However, multivariate analysis was used to determine the significance of unsuccessful treatment among TB/HIV coinfected patients. 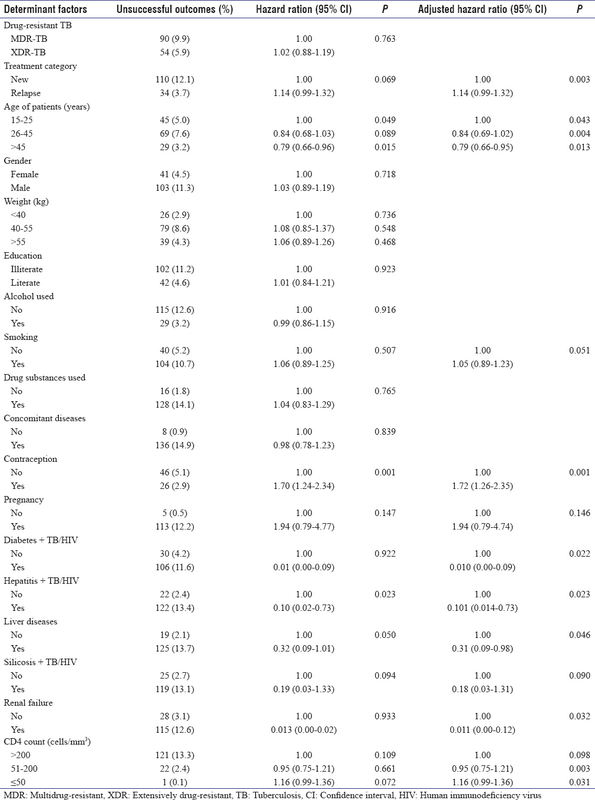 The adjusted hazard ratio indicated that treatment category (95% confidence interval [CI]: 0.988–1.318), age, smoking (1.047; 95% CI: 0.892–1.229), pregnancy (1.940; 95% CI: 0.793–4.743), CD4+ count (1.163; 95% CI: 0.993–1.361), and patients with comorbidity diseases such as diabetes, liver diseases, renal failure, hepatitis, and silicosis were all significantly associated with unsuccessful treatment [Table 2]. However, drug-resistant TB, gender, weight, education, alcohol intake, and contraception were not significantly associated with unsuccessful treatment outcomes in the adjusted multivariate hazard ration analysis of treatment outcomes. Sub-Saharan Africa estimated to be the most prevalence of TB/HIV coinfection as public health challenges. In this study, we found that many of the TB/HIV coinfected patients with unsuccessful outcomes were new patients or defaulted from the treatment. It was found that TB/HIV coinfection contribute independently to each other's progress that adds to the unsuccessful TB treatment outcomes, in which, the result of unsuccessful outcome in this study (51.3%) greater than other studies from Thailand and Nigeria was their unsuccessful treatment outcome were 29.6% and 34.2%, respectively. While the successful outcomes (48.7%) were lower compared to studies from India (84.1%) and Malawi (86.0%), one of the possible reasons for this difference might be due to the number of participant in the study. However, the handling of the defaulted cases among the patients as one of the case definitions of the TB treatment outcome may have an increased effect of unsuccessful treatment outcome. This may also be affected by the high record of patients' death and/or transferred outpatients cases. It is indicated in studies conducted in Malaysia where 21.0% recorded for patients who died and 25.6% for defaulted patients; in Ethiopia, 17.4% were recorded for death and 10.0% for defaulters. In a study from Kelantan showed that smoking is one of the factors associated with unsuccessful treatment outcome among TB/HIV coinfected patients. This is consistent with the current study, which found that smoking is 1.07-fold of risk factor associated with unsuccessful outcomes (AHR: 1.05 95% CI: 0.89–1.23). This is the fact that smoking increases the susceptibility of patients to acquire TB infection because smoking damages the lungs and reduce the immune system of the body. One of the limitations of this study is that we do not have information on opportunistic diseases, the timing of ART, drug conformity, and effects, which might be a positively or negatively factors of treatment outcomes. A prospective study with the inclusion of these data will be of great help in future studies. In addition, anti-TB drug sensitivity testing with routine culture checking was not reordered for TB/HIV coinfected patients, and this might be an associated factor of unsuccessful outcomes. Furthermore, dealing with secondary missing data is one of the limitations faced in this study. Patients' data were retrieved from medical records at both hospitals. This missing data can be minimized if the study was done prospectively, in which, each patient can actively participate. The study showed that the unsuccessful treatment outcomes among TB/HIV coinfected patients were slightly below the WHO target. The key predictors of unsuccessful TB treatment outcomes among the TB/HIV coinfected patients were associated with pregnancy, productive age group (26–45 years), and contraception and comorbidity diseases. Many of these predictors are markers of clinical and epidemiological vulnerability with adaptation to environmental risk. These findings have TB program implications of the policy framework: Provide support to female TB patients and sexually productive age group should be given priorities regarding awareness and intervention to improve the success rate. There is a need to improve the evaluation policy and control framework among TB and HIV coinfected patients. Comorbidity among TB/HIV coinfected patients was found to be more risky. Hence, the involvement of medical and laboratory professional is sorted for in detecting infectious cases earlier, and government involvement in providing adequate funding and support should be put in place. In addition, the early diagnosis of new cases of pulmonary TB and extrapulmonary TB should be implemented rapidly. Furthermore, for more drastic reduction in unsuccessful treatment outcome, community-based DOTS program should be effectively organized to reduce mortality of TB/HIV coinfection. The authors would like to acknowledge all the staff of both Fort Grey TB hospital and Winter-Burg TB hospital for making the data collection easier and all hospital staff who helped out during the process. The authors are also acknowledge the Department of Health, Eastern Cape chapter for approving the study in the province and GRMDC, University of Fort Hare for their support. This study was financially supported by Govan Mbeki Research and Development Center. World Health Organization. Global Tuberculosis Report 2016. Geneva, SwiWorld Health Organization; 2016. World Health Organization. WHO Policy on Collaborative TB/HIV Activities. Guidelines for National Programmes and Other Stakeholders. Genva, Switzerland: World Health Organization; 2016. Jacobson KB, Moll AP, Friedland GH, Shenoi SV. Successful tuberculosis treatment outcomes among HIV/TB coinfected patients down-referred from a district hospital to primary health clinics in rural South Africa. PLoS One 2015;10:e0127024. Manosuthi W, Wiboonchutikul S, Sungkanuparph S. Integrated therapy for HIV and tuberculosis. AIDS Res Ther 2016;13:22. Nglazi MD, Bekker LG, Wood R, Kaplan R. The impact of HIV status and antiretroviral treatment on TB treatment outcomes of new tuberculosis patients attending co-located TB and ART services in South Africa: A retrospective cohort study. BMC Infect Dis 2015;15:536. Lawn SD, Myer L, Edwards D, Bekker LG, Wood R. Short-term and long-term risk of tuberculosis associated with CD4 cell recovery during antiretroviral therapy in South Africa. AIDS 2009;23:1717-25. Havlir DV, Kendall MA, Ive P, Kumwenda J, Swindells S, Qasba SS, et al. Timing of antiretroviral therapy for HIV-1 infection and tuberculosis. N Engl J Med 2011;365:1482-91. Blanc FX, Sok T, Laureillard D, Borand L, Rekacewicz C, Nerrienet E, et al. Earlier versus later start of antiretroviral therapy in HIV-infected adults with tuberculosis. N Engl J Med 2011;365:1471-81. Abdool Karim SS, Naidoo K, Grobler A, Padayatchi N, Baxter C, Gray AL, et al. Integration of antiretroviral therapy with tuberculosis treatment. N Engl J Med 2011;365:1492-501. Peter JG, Theron G, Singh N, Singh A, Dheda K. Sputum induction to aid diagnosis of smear-negative or sputum-scarce tuberculosis in adults in HIV-endemic settings. Eur Respir J 2014;43:185-94. Banerjee A, Moyo S, Salaniponi F, Harries A. HIV testing and tuberculosis treatment outcome in a rural district in Malawi. Trans R Soc Trop Med Hyg 1997;91:707-8. Agbor AA, Bigna JJ, Billong SC, Tejiokem MC, Ekali GL, Plottel CS, et al. Factors associated with death during tuberculosis treatment of patients co-infected with HIV at the Yaoundé Central Hospital, Cameroon: An 8-year hospital-based retrospective cohort study (2006-2013). PLoS One 2014;9:e115211. Chennaveerappa PK, Nagaral J, Nareshkumar MN, Praveen G, Halesha BR, Vinaykumar MV. TB-DOTS outcome in relation to HIV status: Experience in a medical college. J Clin Diagn Res 2014;8:74-6. Ejeta E, Chala M, Arega G, Ayalsew K, Tesfaye L, et al. Treatment Outcome of Tuberculosis Patients under Directly Observed Treatment of Short Course in Nekemte Town, Western Ethiopia: Retrospective Cohort Study. Gen Med (Los Angel) 2015;3:1000176. doi: 10.4172/2327-5146.1000176. Shaweno D, Worku A. Tuberculosis treatment survival of HIV positive TB patients on directly observed treatment short-course in Southern Ethiopia: A retrospective cohort study. BMC Res Notes 2012;5:682. Tweya H, Feldacker C, Phiri S, Ben-Smith A, Fenner L, Jahn A, et al. Comparison of treatment outcomes of new smear-positive pulmonary tuberculosis patients by HIV and antiretroviral status in a TB/HIV clinic, Malawi. PLoS One 2013;8:e56248. El-Sony AI, Khamis AH, Enarson DA, Baraka O, Mustafa SA, Bjune G, et al. Treatment results of DOTS in 1797 sudanese tuberculosis patients with or without HIV co-infection. Int J Tuberc Lung Dis 2002;6:1058-66.
van den Broek J, Mfinanga S, Moshiro C, O'Brien R, Mugomela A, Lefi M, et al. Impact of human immunodeficiency virus infection on the outcome of treatment and survival of tuberculosis patients in Mwanza, Tanzania. Int J Tuberc Lung Dis 1998;2:547-52. Henegar C, Behets F, Vanden Driessche K, Tabala M, Bahati E, Bola V, et al. Mortality among tuberculosis patients in the democratic republic of Congo. Int J Tuberc Lung Dis 2012;16:1199-204. Kaplan R, Caldwell J, Middelkoop K, Bekker LG, Wood R. Impact of ART on TB case fatality stratified by CD4 count for HIV-positive TB patients in Cape town, South Africa (2009-2011). J Acquir Immune Defic Syndr 2014;66:487-94. Odone A, Amadasi S, White RG, Cohen T, Grant AD, Houben RM, et al. The impact of antiretroviral therapy on mortality in HIV positive people during tuberculosis treatment: A systematic review and meta-analysis. PLoS One 2014;9:e112017. UNAIDS. A Guide to Monitoring and Evaluation for Collaborative TB/HIV Activities, 2015 Revision. Geneva, Switzerland:UNAIDS; 2015. National Department of Health South Africa. TB DOTS Strategy Coordination, South Africa National Tuberculosis Management Guidelines; 2014. Belay M, Bjune G, Abebe F. Prevalence of tuberculosis, HIV, and TB-HIV co-infection among pulmonary tuberculosis suspects in a predominantly pastoralist area, Northeast Ethiopia. Glob Health Action 2015;1:1-7. Del Amo J, Pérez-Hoyos S, Hernández Aguado I, Díez M, Castilla J, Porter K, et al. Impact of tuberculosis on HIV disease progression in persons with well-documented time of HIV seroconversion. J Acquir Immune Defic Syndr 2003;33:184-90. Pimchan N, Suggaravetsiri P, Tesana N, Chaiklieng S. The associated factors with unsuccessful tuberculosis treatment outcomes among TB/HIV co-infected patients in Surin Province, Thailand. J Med Sci 2012;6:214-21. Oshi DC, Oshi SN, Alobu I, Ukwaja KN. Profile, outcomes, and determinants of unsuccessful tuberculosis treatment outcomes among HIV-infected tuberculosis patients in a Nigerian state. Tuberc Res Treat 2015;10:1-8. Tripathi SB, Kapadia VK. Treatment outcome of tuberculosis in HIV seropositive patients: An experience of southeast region of Ahmedabad. Natl J Community Med 2015;6:462-5. Ismail I, Bulgiba A. Determinants of unsuccessful tuberculosis treatment outcomes in malaysian HIV-infected patients. Prev Med 2013;57 Suppl: S27-30. doi: 10.1016/j.ypmed.2012. Eyasu E, Tadesse B, Tsedeke W. Tuberculosis treatment outcomes among tuberculosis/human immunodeficiency co-infected cases treated under directly observed treatment of short course in Western Ethiopia. J AIDS HIV Res 2014;6:164-71. Sinshaw Y, Alemu S, Fekadu A, Gizachew M. Successful TB treatment outcome and its associated factors among TB/HIV co-infected patients attending Gondar University Referral Hospital, Northwest Ethiopia: An institution based cross-sectional study. BMC Infect Dis 2017;17:1-9. Gebremariam MK, Bjune GA, Frich JC. Barriers and facilitators of adherence to TB treatment in patients on concomitant TB and HIV treatment: A qualitative study. BMC Public Health 2010;10:651. Bekker A, Schaaf HS, Draper HR, Kriel M, Hesseling AC. Tuberculosis disease during pregnancy and treatment outcomes in HIV-infected and uninfected women at a referral hospital in Cape town. PLoS One 2016;11:e0164249. Mekonnen D, Derbie A, Desalegn E. TB/HIV co-infections and associated factors among patients on directly observed treatment short course in Northeastern Ethiopia: A 4 years retrospective study. BMC Res Notes 2015;8:666. Gao J, Zheng P, Fu H. Prevalence of TB/HIV co-infection in countries except China: A systematic review and meta-analysis. PLoS One 2013;8:e64915. Louwagie GM, Ayo-yusuf OA. Factors associated with retreatment tuberculosis in Tshwane, South Africa: The role of tobacco smoking. S Afr J Infect Dis 2014;29:87-90. Nor RNM, Mohd NS, Wan MZ, Sharina D, Nik RNH. Factors associated with unsuccessful treatment outcome of pulmonary tuberculosis in Kota Bharu, Kelantan. Malays J Public Health Med 2011;11:6-15. El-shabrawy M, El-shafei DA. Evaluation of treatment failure outcome and its predictors among pulmonary tuberculosis patients in Sharkia Governorate, 2013–2014. Egypt J Chest Dis Tuberc 2017;66:145-52. Ahmed M, Omer I, Osman SM, Ahmed-Abakur EH. Association between pulmonary tuberculosis and type 2 diabetes in Sudanese patients. Int J Mycobacteriol 2017;6:97-101. Pérez A, Brown HS 3rd, Restrepo BI. Association between tuberculosis and diabetes in the Mexican border and non-border regions of Texas. Am J Trop Med Hyg 2006;74:604-11. Chiang CY, Lee JJ, Yu MC, Enarson DA, Lin TP, Luh KT, et al. Tuberculosis outcomes in Taipei: Factors associated with treatment interruption for 2 months and death. Int J Tuberc Lung Dis 2009;13:105-11. Anunnatsiri S, Chetchotisakd P, Wanke C. Factors associated with treatment outcomes in pulmonary tuberculosis in Northeastern Thailand. Southeast Asian J Trop Med Public Health 2005;36:324-30. Mnisi T, Tumbo J, Govender I. Factors associated with pulmonary tuberculosis outcomes among inmates in Potchefstroom Prison in North West province. S Afr J Epidemiol Infect 2013;28:96-101. Vasankari T, Holmström P, Ollgren J, Liippo K, Kokki M, Ruutu P, et al. Risk factors for poor tuberculosis treatment outcome in Finland: A cohort study. BMC Public Health 2007;7:291. Kirenga BJ, Levin J, Ayakaka I, Worodria W, Reilly N, Mumbowa F, et al. Treatment outcomes of new tuberculosis patients hospitalized in Kampala, Uganda: A prospective cohort study. PLoS One 2014;9:e90614.